Although we love any form of travel, we’re always on the lookout for a great boomer road trip adventure. Last month, guest contributor Diane White took us on a Harley Adventure to the Four Corners. Today, she’s back to take us on a road trip down south to Georgia’s gorgeous Golden Isles. At low tide, little explorers claim their own deserted St. Simons sandbar island. I’m well aware that Jim would rather ride through a cyclone than remain cooped up for long. As the claustrophobe in this family, Jim’s travel feet are always itchy. Five days into a lengthy stretch of tropical storms drowning the Coastal South, signs of severe boredom abound: mornings abed, daily computer Solitaire-a-thons, frequent glowering out rain-soaked windows, and loud snorts of disgust over each new soggy weather forecast. On the sixth drab, sodden day Jim pinned me beneath a gaze of agitation mingled with resolve. I admire the ease with which Jim ignores inconvenient travel realities. “Lowcountry” is a cautionary, not romantic, description of our region. Had he forgotten the historically high king tides and record-breaking rainfall? Just the day before, two feet of tidal creek water blocked the road off our island for more than an hour. More heavy rains and king tides could mean some flooding here and on St. Simons. I grimaced. “We’ll stay in a four-star resort on the beach,” Jim wheedled. This meant Jim really did need a trip. He’s leery of accident-prone intersections and parking entrances and unfazed by high-speed interstate traffic. However, he knows monstrous big-rigs roaring along the interstates freak me out even in dry weather, much less rain. “I’ll check,” I sighed, hiding the interest piqued by such concessions from my habitually weather-proof husband. He’d asked me to check the calendar, but my perspective differed. Appointments can be moved, while weather can’t. That’s what I’d be checking! NOAA coastal forecasts and my favorite mobile weather app (WeatherBug) both declared the coming ten days would be stormy except for one short “partly cloudy” interlude in just two days. That decided it all, for me. “We can leave Thursday morning and come home Saturday afternoon,” I stated, confident my itchy-travel-footed spouse would accept without question. Sure enough, Jim began an on-line hotel booking session at once. His dedication to online shopping rivals any Millennial’s – few baby boomers and fewer from Jim’s Silent Generation seem so comfortable in virtual malls. Even he has limits, though, particularly when already impatient and bored. Boomers, never underestimate the personal touch. One short friendly chat with the King and Prince Resort front desk punched right through the website’s two-nights-required obstacle, established our preference for a second-floor-with-balcony room in the original 1935 hotel building, and bagged an extra 20% discount the website didn’t mention. 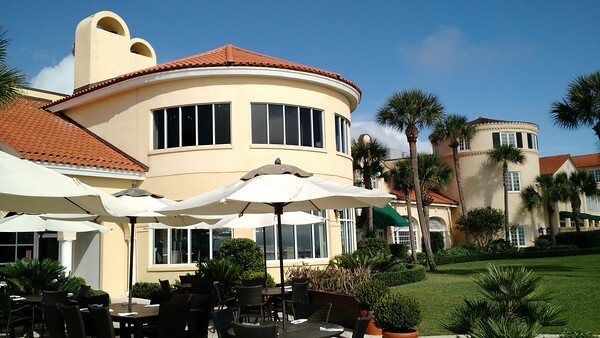 The original 1935 hotel building of St. Simons Islands’ luxurious King and Prince Resort. Online travel service providers like Booking.com, Hotwire, Expedia and many others offer convenience and speed. Bing-bang-boom, you’re done. These sites won’t always offer the best overall solution, though. Know your priorities. For instance, if you need flexibility as well as economy, a “noncancellable” booking through Hotwire could easily backfire. Also, some sites charge nonrefundable direct fees – check before you click! Why breathe interstate fumes when riding back roads lets me grow giddy with the pungent, slightly salty smell of Lowcountry? I proposed a “Goldilocks” route — not too long but not too short, not too busy but not too boring; in short, just right. We’d ride through wide, flat expanses of marsh grass, occasional groves of pecan trees, and spectacular live oaks with silvery Spanish moss waterfalls flowing from long arching limbs. Directions were simple: from Beaufort, take Route 802 to Route 170; head south to Route 17; continue south towards Brunswick, GA to the well-marked left turn onto Torras Causeway east towards St. Simons Island. An hour into this route, one may easily satisfy any sudden urge for a movie, meal, or excellent shopping by detouring slightly to Bluffton, SC. Every urban convenience imaginable can be found somewhere along Route 278 heading east from Route 17 to Hilton Head. Eye-catching Lowcountry autumn garden in Old Town Bluffton, SC. 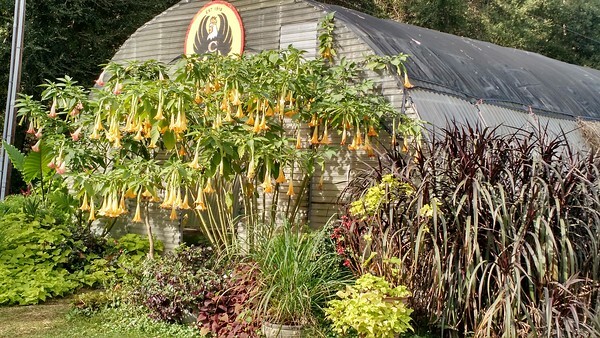 For those seeking small-town nostalgia, remain on Route 17 to Route 46 before turning east and visit Old Town Bluffton instead of the retail Mecca on Route 278. Six blocks of former family homes now shelter antique stores and artisan shops, galleries and jewelry stores, and locally owned eateries. Free of parking meters or paved parking lots, Old Town retains a sweet quaint character. We didn’t stop in either new or old Bluffton on this trip but, having visited both many times, encourage you to explore them. Certainly the next community on our route south deserves far more than the drive-by treatment we gave it. Approaching beautiful Savannah, GA from the north, the soaring Talmadge Memorial Bridge allows brief but memorable views of a centuries-old riverfront to the left and bustling modern Port of Savannah to the right. Bent on reaching St. Simons Island and a long beach walk before nightfall, we resisted the siren song of Route 17’s Historic District exit on the Savannah River’s south bank…but it wasn’t easy. For those similarly intent on forging south without delay, follow Route 17 signs no matter what other routes are offered. You’ll avoid nearly all city traffic via a short stint on I-316 / I-16 that soon rejoins Route 17 proper. Below Savannah and its southern sister community Richmond Hill come miles of trees, marshes, and blink-and-you’ll-miss-it towns like Midway, Riceboro and Eulonia. Another time, we’d like to explore Midway’s Cay Creek Wetlands Interpretive Center, sample Rice Festival fare in Riceboro, and linger over amazing seafood at Altman’s Restaurant in tiny Eulonia. For this trip, we’d stick to our one-stop-only plan allowing for a late lunch in Darien and arrival by check-in time at the King and Prince Resort. Darien combines compelling history as a colonial Georgia military outpost with present-day appeal as a central destination along Georgia’s beautiful Golden Isles. Its attractive crossroads beside the Darien River access tidal Altamaha River Basin waters that support local shrimpers, crabbers, and fishermen. Fortune smiled upon us twice in Darien – first with a hiatus from heavy rains and second by unexpectedly introducing us to Darien’s annual one-day Fall Fest. After having our lunch as planned, we stayed a while to take in the sights and sounds of this small town harvest-time celebration. 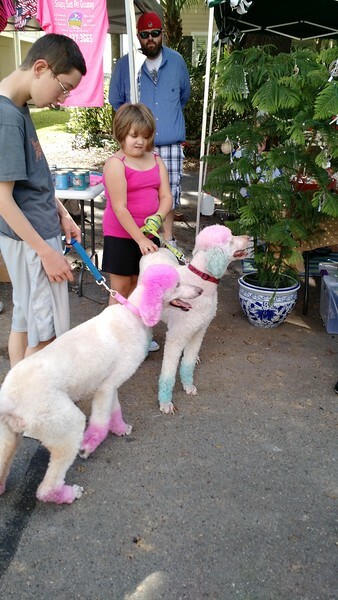 Darien’s Fall Fest brings out the colorful side of every resident, including these poodles. Darien makes a fine base for adventuring throughout Georgia’s Coastal Empire, but don’t miss its must-see attraction: Fort King George, the oldest English fort remaining on Georgia’s coast. Built in 1721 as His Majesty’s southernmost North American military site, serving there was certainly no picnic. Colonel John “Tuscarora Jack” Barnwell and his men endured seven years of swamp-induced disease, threat of Spanish and Indian attacks, fire, and food shortages before finally abandoning it. In 1736, British General James Oglethorpe brought Scottish Highlanders who successfully reestablished the vacant fort and adjacent village they named “Darien”. One mile from downtown Darien stands Georgia’s oldest remaining English fort, a must-see on this route. 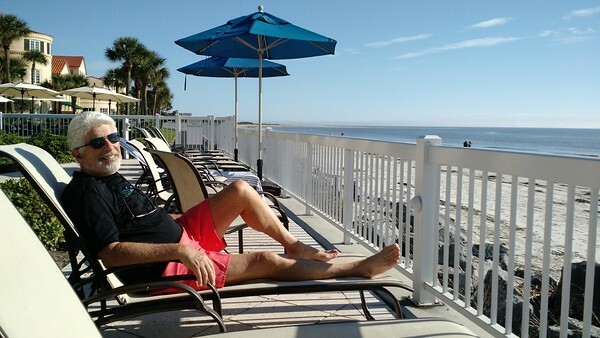 Our destination, the luxurious King and Prince Resort on St. Simons Island, is only a half hour south of Darien. We checked in and swapped motorcycle togs for bathing suits and flip-flops to stroll the uncrowded beach beneath those partly cloudy afternoon skies. Two hours later, as darker clouds gathered and temperatures dipped below 70 degrees, we retreated to our room for a nap and cocktails on the balcony before dining at Echo, the resort’s excellent restaurant. We ate every meal but one there during our stay, usually at a favorite outdoor table mere yards from the beach. 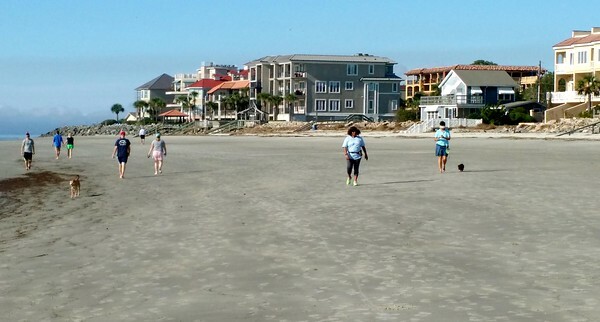 Two- and four-legged beachcombers alike enjoy St. Simons Islands’ pet-friendly sand and surf. We timed beach walks to take best advantage of St. Simons’ dramatic tides, which have a six- to nine-foot range. 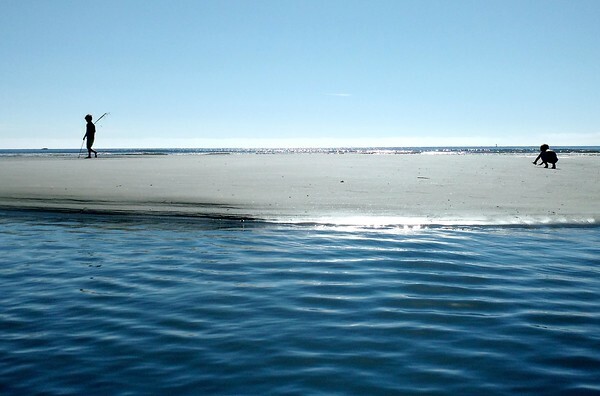 At low tide, a chain of sandbars close to shore emerges and the water between them becomes shallow enough to stroll and splash from one end to the other. Birds and people both flock to them in search of shells or sea creatures not so easily captured on the beach itself. The beach is also pet-friendly, creating a relaxed, unpretentious setting to share sun and sea with dogs romping freely along the sand or in the surf. The resort is a 20-minute walk or 3-minute drive from St. Simons’ main shopping and dining area. 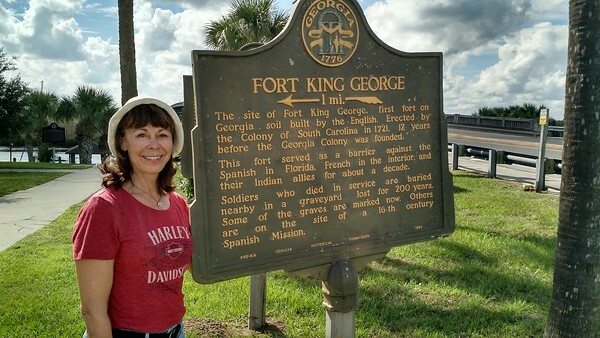 We drove the Harley in anticipation of a pleasure ride around other parts of the Golden Isles after visiting the St. Simons Lighthouse, St. Simons Island Pier, and intriguing stores along Mallery Street or Ocean Boulevard. It’s a short ride to Jekyll Island or Little St. Simons Island, and our weather luck held as we cruised at will for a couple of hours both days. On Saturday morning we dawdled over several cups of good hot coffee, delicious bowls of steel cut oats, and a big fresh fruit platter, serenaded by the nearby rush and sighs of high tide surf. We took time for one more beach walk and read one more newspaper while stretched out on thickly cushioned chaise lounges facing the ocean. Rain was on the way, our short partly-cloudy travel window was shutting by the hour, but still we lingered. Jim enjoys one last after-breakfast lounge on a King and Prince Resort chaise. At the last possible moment, we made ready to leave. Unlike poor Goldilocks, who found her “just right” haven only to be chased away forever, Jim and I are sure to return to this favorite haunt. Have you ever been to St. Simons or Georgia’s Golden Isles or are you planning a trip? Join the conversation at the My Itchy Travel Feet page on Facebook or send us an email to ask a question or share your experience. Diane White is a Beaufort, SC-based speaker and author on do-it-yourself travel in one's 60s and beyond. She and her husband Jim represent a particular breed of active Baby Boomer travelers. Like other retirees, they have more time for long trips, but unlike most, these two primarily travel alone on their motor yacht or motorcycle.